Students let out of Armour School, 950 W. 33rd Place in Bridgeport, on Feb. 4, 2013. CHICAGO — More than 300 schools aren't fully using their space and have fewer students than they should, according to a Chicago Public Schools report. The report, which has been used in the past to close 50 schools, says only about 200 schools are efficiently using their space and enrolling the right amount of students. 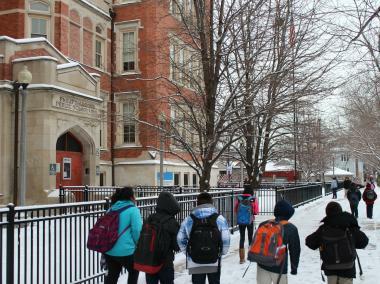 Dozens of schools have been closed or consolidated since CPS said the district was facing "a very real and daunting utilization crisis" in 2013, but critics said then and now that the formula for reviewing schools and their "utilization" is flawed. The report and its findings are important in ensuring "students have equal access to a learning environment that effectively supports strong instructional programs," according to CPS. The review looks at if schools have too few or too many students based on their space and resources, among other factors. "The proper utilization of District facilities is an important factor in ensuring CPS makes the most of its limited resources, and the District is committed to making improvements in this area," CPS spokesman Michael Passman said in a prepared statement. "During the past year, CPS has taken steps to address overcrowding in District schools by adding additional seats at overcrowded schools. Underutilization continues to be a challenge for the District, and we are evaluating potential opportunities to improve facility utilization to maximize resources and strengthen school environments." • 313 schools are "underutilized"
• 229 schools are "efficient"
• 23 schools are "overcrowded"
The Chicago Teachers Union is "incredibly" concerned the formula and Tuesday's report from CPS could lead to more closures, said spokeswoman Sarah Hainds, even though there's not proof closures and consolidations benefited the district or its students in 2013. "Most" principals dispute CPS' formula and its results, Hainds said, including principals at "overcrowded" schools. Even schools that have what could be deemed extra space use those areas for special education, parent rooms, tutors, nonprofits or health clinics, Hainds said. "And none of that gets calculated, which is ridiculous because you can't produce the kind of academic outcome that CPS is calling for without" those programs, Hainds said. CPS officials said the district is required to file the utilization report, and said the data set "is one of many considered in discussions about potential facility modifications, but we will not make decisions based on this report alone." But, even while public schools are closed or consolidated because they're "underutilized," more private and charter schools have opened up, said Wendy Katten, a spokeswoman for public education advocacy group Raise Your Hand. Katten's arguments echoed what she and other critics said when CPS closed schools in 2013 after deeming they were underutilized: They said CPS uses a "flawed formula" that calls for a class size of 30 students and doesn't take into account how classrooms are used or how large a school's special education population is. "This basically encourages large class sizes, which we know is bad education policy," Katten said. "Fair-minded districts actually look at program use, look at what's happening in the building, they look at populations of students. "We're not saying that there aren't any schools that have a low number of students; it's just that this particular formula exaggerates the under-utilization and isn't fair." Katten said she's seen that firsthand: During walkthroughs, she's seen schools that didn't have any empty classrooms even though they were listed as being "underutilized." CPS' method renders "special education completely invisible," as a school that has five classrooms for students with special needs might have eight or 12 students in each room, but CPS' review says there should be 30, Katten said. Two CTU-backed lawsuits sought to slow down or stop closures in 2013, citing concerns over the effects on special education students. "This formula is about cramming as many kids in a building and having an arbitrary number that doesn't match the real needs or uses, in many cases, of the way the building is being utilized," Katten said. But CPS officials said the number of overcrowded schools dropped from 24 to 22 in 2015. Annexes opened last year at Lincoln, Wildwood and Oriole Park, and classrooms were added at Dore and Mt. Greenwood.